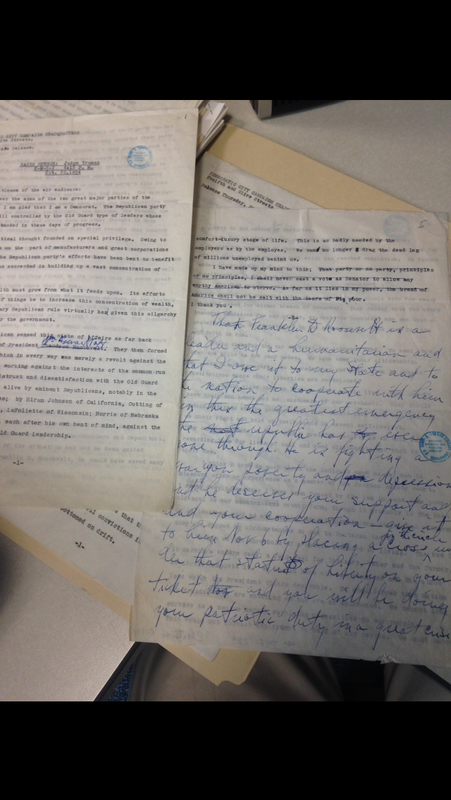 Today I scanned a small portion of a larger collection of President Truman’s papers. This collection consisted of Truman’s speeches from his first senate campaign of 1934. At first glance, the collection seemed like a bunch of typed copies of his speeches, but as I glanced through the collection, I found that Truman edited many of them with his own hand. This showed that Truman was hands-on in the editing process and has a strong say in what information he felt was important to the electorate. At one point, Truman completely rewrote the conclusion to a speech before it was delivered to the public as seen below. This entry was posted in HistoryMaking and tagged Archival Methods, Truman Library and Museum on December 10, 2014 by Chad King.